I've been keeping a monthly photo log of my progress so whenever I start to wonder what I used to look like, I can review my progress on a month-by-month basis... and now you can too! 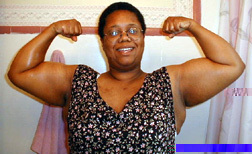 The images displayed herein are strictly the property of "Gaily's World of Lifting Large" web site. These images shall not be distributed or reposted without the consent of this site's proprietors.